Last week on So You Think You’re Crafty I showed off my new outfit refashioned from some thrifted men’s dress clothes. 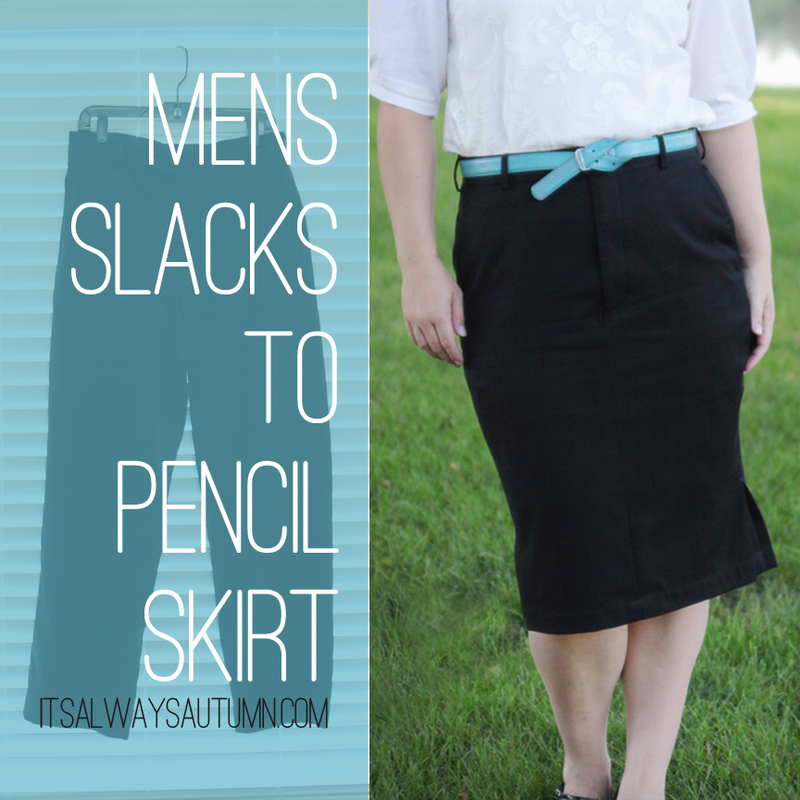 Today I’ll show you how I created the pencil skirt from a pair of slacks. 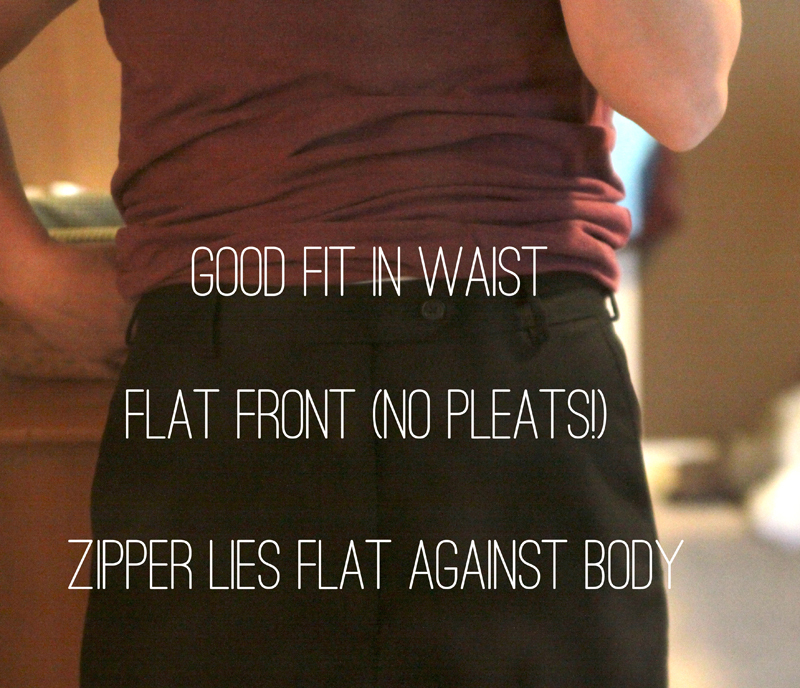 First, you want the slacks to fit well in the waist. You don’t want to mess with the waistband at all, so make sure the pants fit well wherever you’d like to skirt to sit (up on a high waist, down lower on your hips, wherever you’d like). Next, look for flat front pants. Front pleats are generally not as flattering and they make fitting a pencil skirt difficult. Third, you want to be sure the zipper lies flat against your body – meaning that it doesn’t angle in toward the crotch or out away from your body (like in a roomier fit pant). Most flat front pants will be just fine in the zipper – it’s just something to think about. When looking for slacks at the thrift store, start with the size that matches your women’s size – like if you are an 8, start looking at 28 size waist paints – but also look through the pants a size bigger and smaller – it’s hard to know how men’s slacks will fit, so it’s worth trying on lots of pairs to find the best one. But don’t make it too tight at this point! We are going to take it in a little more at each side with fun side kick pleats, so bring it in just enough to give some definition. Next you want to hem the bottom, so determine where you want you skirt to hit and pin that point. Fold the extra material under twice, so the final fold is at your pin, and sew. 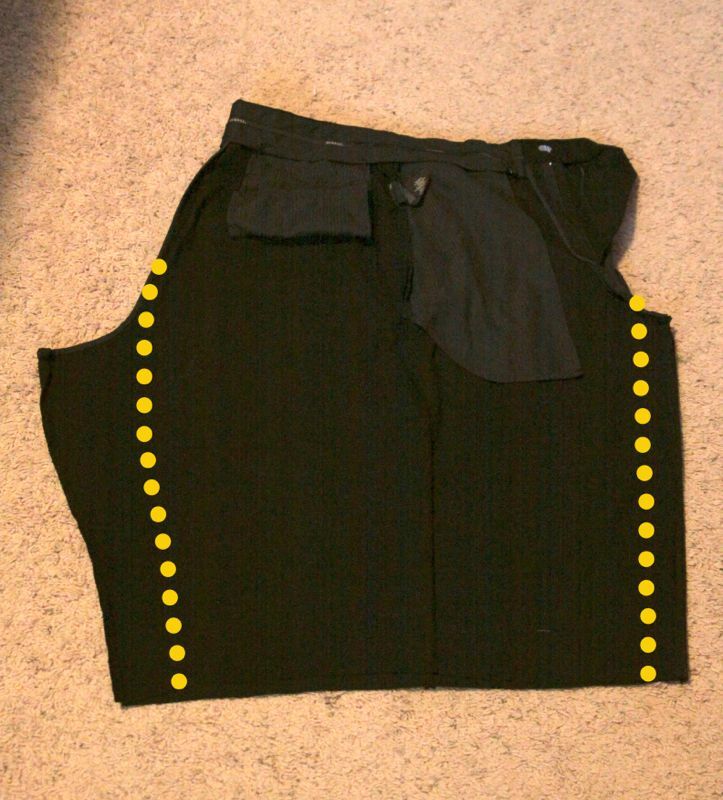 This pulls the skirt in around your knees to give a pencil shape as well as a cute little flare at the bottom that helps give you room to walk. 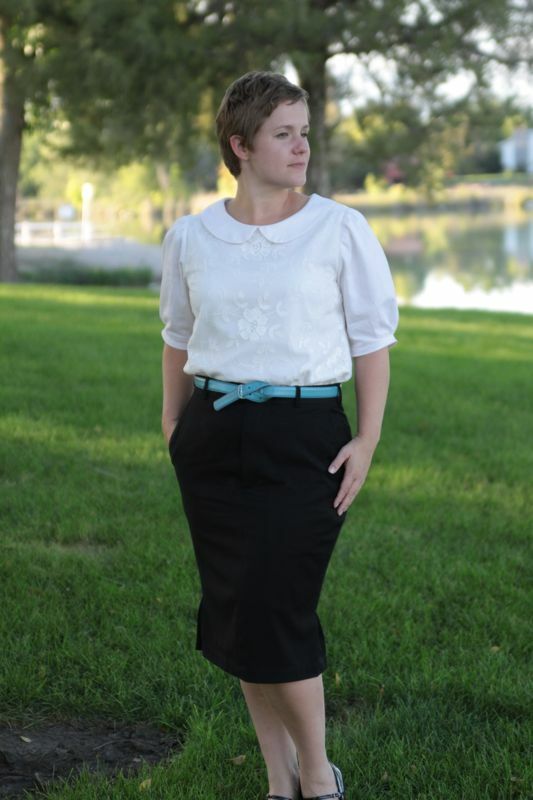 Here’s the completed skirt and blouse. 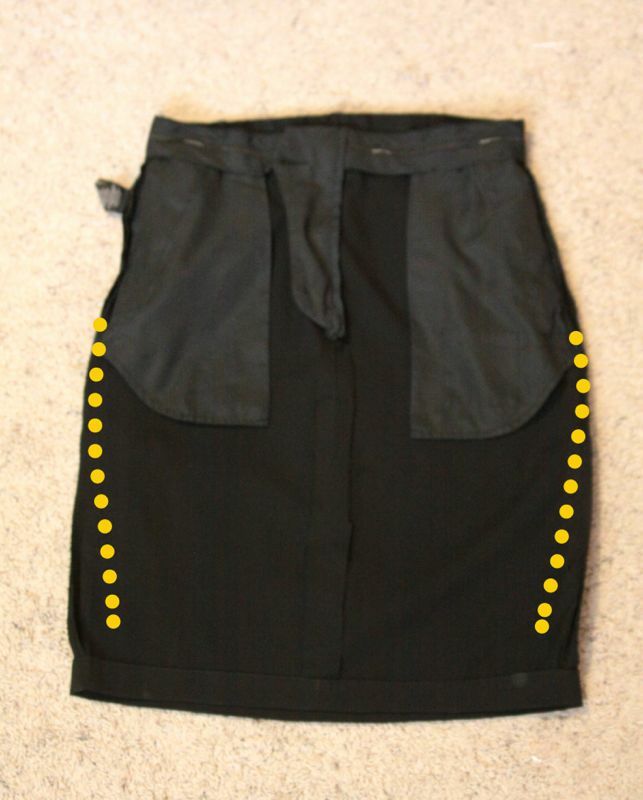 I love this skirt refashion! You did a fabulous job. I can’t wait to see the blouse tutorial too. I love the cute collar you made. Very nicely done! I love repurposing clothes. 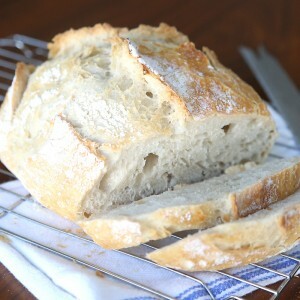 I think I am going to have to try this one. I also love your shoes in the picture. This is a beautiful skirt! I have two pairs of pants! 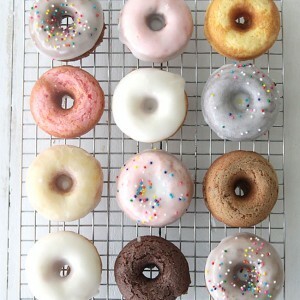 Their actually women’s, but they’re much too big for me…I plan to attempt this very soon! 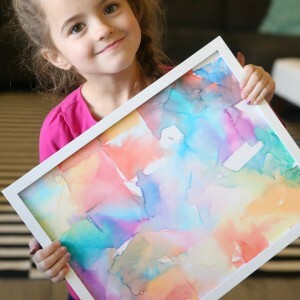 This is a great tutorial and you look great too! 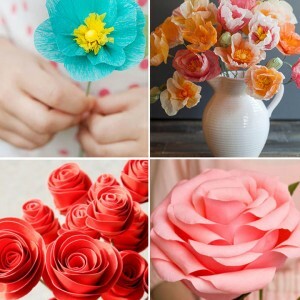 I was just a little confused with the kick pleats and how to make them. You said “side kick pleats” but in one of the pictures, it looked like the kick pleat was in the back. Sorry, just a little confused or maybe I couldn’t really tell because the pants were black and couldn’t see the detail. I bought a pair of men’s slacks at the thrift store for 1.29! OMG! This tutorial was absolutely perfect. 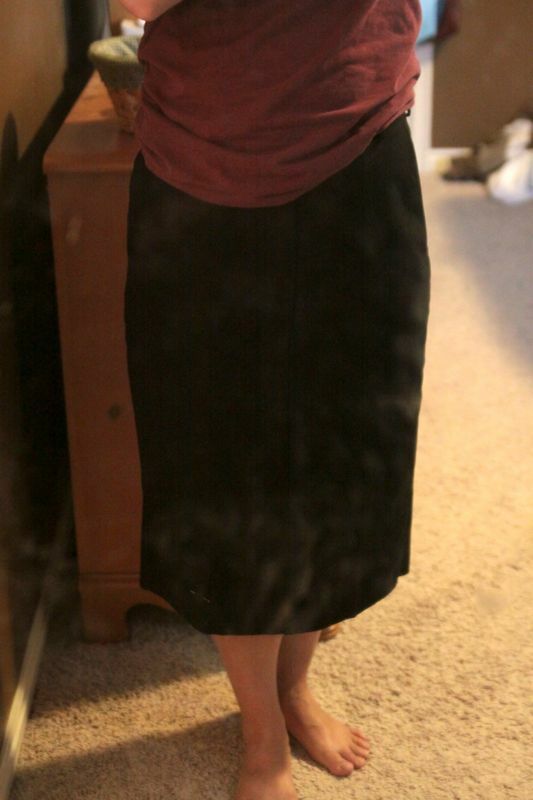 I wish i could post a picture of how well (and cute) this skirt turned out. Thanks!